The first step in finding a good antique writing desk for your home or office is to determine whether a certain period style or the features and functionality of the desk are more important to you. If this antique writing desk will be for day-to-day use, we recommend starting your search by determining your minimum practical requirements like the size of the writing surface, number of drawers and filing cabinets, whether you need a partners desk or single-sided writing table, etc. However, if this is going to be an accent or conversation piece in your home that won't be used as frequently, start your search with the look and style of desk: Do you prefer something elegant and slender without too much ornamentation? 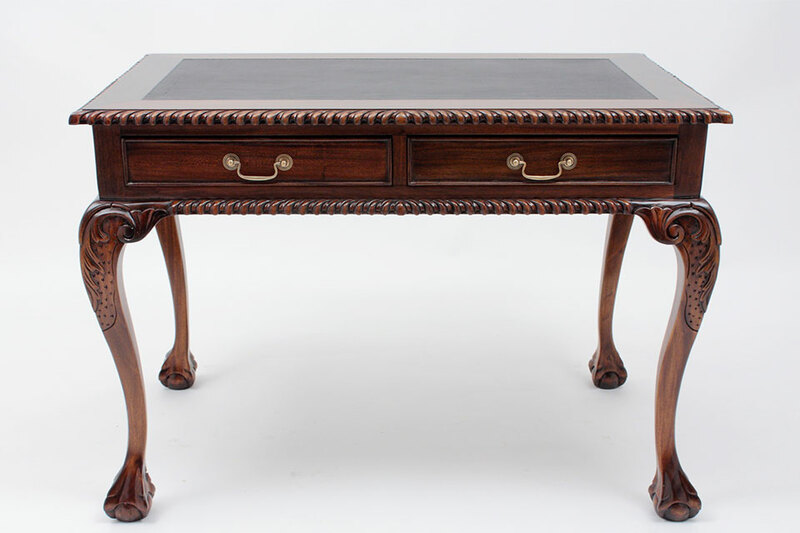 Then go with a Queen Anne reproduction antique desk with its slender legs and pad feet. Or, do you prefer a more stately and masculine style? You can't go wrong with a Chippendale reproduction antique desk with ball and claw legs. Here at Laurel Crown we build our antique writing desks in a variety of American and European period styles with the same real hardwoods as the originals. We also proudly use the same tried-and-true cabinetmaking techniques, except that everything we build is brand new meaning your reproduction antique desk will be sturdy, durable, and uncompromised by use or time. We have individually crafted each writing table and desk by hand to replicate traditional period-specific designs from 17th, 18th, and 19th century England, France, and Colonial America. Every antique style desk we create features distinctive details carved by hand for an eye-catching addition you will love. The smaller details, such as rope detailing along the table edges, reeded table legs, and carved feet, make a solid choice for individuals looking for a traditional workspace environment. Choose from a variety of layouts and sizes to fit your needs, including small desks with a single row of drawers or larger desks with stacked drawers and legal-size filing cabinets on either side. Can't find the perfect desk? Don't sweat it. We can customize any of our antique writing desks in your desired size, color, and even with additional features or design motifs. At Laurel Crown, we love antiques as much as you do which is why we are dedicated to crafting high-quality period replicas. We have over 25 years of experience in cabinetmaking and custom building antique-inspired furniture for our valued clients. With Laurel Crown piece showcasing guild-quality craftsmanship and attention to detail, you are sure to find a desk or writing table that will be the perfect centerpiece of your home office. If you have any questions or require assistance, our team would be happy to assist you further while shopping with us.